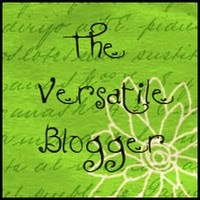 I’ve won a Versatile Blog Award! I’ve been nominated twice for this award in recent weeks, and due to my extreme tardiness, am only getting around to writing this post now. So, a huge apology is required to the lovely folk at Willow Cottage Garden. Please go and visit their lovely blog now, to make up for me being a bit rubbish and late with this post, and also because they’re mad enough to be living in their garden with their kids this summer while some work is being done to their house. Oh, and they also write lovely blog posts about gardening, chickens, food, and all manner of ‘The Good Life’ loveliness. They’re ace. Then, go and visit the multi-talented and all round Herman cake guru that is Catherine at For Bella and Will because she nominated me too. I’m so grateful to them both for this – I think ‘Versatile’ is a very positive way of describing this blog, and given that I miss out on being a real part of the ‘mummy blogging’ community, because I don’t really blog about my kids, it’s nice to be recognised for something lovely. So, a huge thank you to them. There are rules about accepting this award. I might break them though. I have a habit of doing that. Firstly I have to thank the people who nominated me. Then I have to nominate 15 other people. Oh crikey. I don’t know 15 other blogs. Truthfully. Hmm. Finally, I have to tell you seven things about myself. Right. I can do this. 1: I am a Gemini. This proves useful on occasion, as my Mum uses it as a reason for accepting my scanner ways. Being a Gemini is like being a scanner, according to her. I often read my horoscope. When it suits me, I choose to believe it and when it doesn’t, I happily dismiss it. I’m fairly sure most of us do that though. 2: Many moons ago, I used to work as a riding instructor at a stables connected to a castle. Said castle was haunted, and the stableyard was right next to the family graveyard. When we used to do late night checks on the horses, we used to run around the yard at breakneck speed, just in case we bumped into the headless horseman. No-one ever did though. 3: I have a rubbish tattoo. I got it by accident when I went with a friend to get her nose pierced. She took so long deciding whether to go ahead with it or not, by the time we came out I was inked. I was only 17, and the place was a bit dodgy so it’s a rubbish tattoo. Still, if I ever need to be indentified, there will be a distinguishing feature. Every crime drama I’ve seen seems to suggest this will be a useful thing, so the rubbish tattoo stays. 4: I’m pretty sure I have one hip bigger than the other. If I ever get to know you well, I’ll show you and you can be the judge. 5: At Easter, when I was in the house on my own, I put my wedding dress on just for fun and got stuck in it. It’s not too small, I hasten to add, but I pulled the laces really tight and then couldn’t get it off again. Took me hours to finally extract myself. For a moment, I thought I’d have to go to Easter Sunday dinner wearing it. 6: Despite all the stories about people not knowing their neighbours these days, I am trusted with a spare set of keys and the alarm code to my neighbour’s house. I think this proves beyond all doubt that I am a Good Person. 7: I’ve had lots of cats in my life, yet I’ve never gone out to deliberately obtain a cat. They all arrive by accident. My latest arrived on holiday when my oldest friend was planning her emigration, and she’s never left. When she arrived, she was so scared of us she lived under a sofa, and now she yells at me all the time. Thank you for your kind comments! Yes, we are mad to be living in the garden over the summer. Just hope the sun keeps shining!